We left Ottawa very early on Sat morning (Nov 8th) amid news that a hurricane was about to make landfall in Cuba. We had decided to wait until Nov. to go to Cuba because the risk of hurricanes was supposed to be lower! Luckily, we didn’t have any problems as a result. Our flight from Toronto to Havana left on time and landed on time with no issues at all. The hurricane made landfall much further to the East of Havana, and so the only effects we felt were windy grey conditions for our first afternoon in Havana. We checked into our hotel, which was in the neighbourhood of Vedado. After finding some lunch, we decided to walk around. We walked through the Hotel Nacional, which is a beautiful old hotel and has a beautiful view of the ocean, where some famous Americans stayed before the embargo (Errol Flynn, Marlon Brando, Ernest Hemingway). 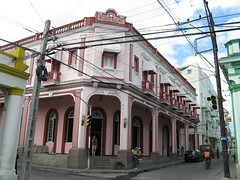 We also went to the Hotel Havana Libre, which used to be the Havana Hilton. It was a bit more modern in design, but no less famous. 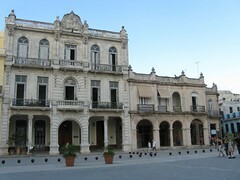 It was used as Fidel Castro’s headquarters after he assumed power in 1959. We had a late dinner in the hotel, which would be the first of many where our options were chicken or pork, plus rice, black beans and fries. Unfortunately, we did not take the opportunity to go to the jazz club around the corner, or to the show that was on at the Hotel Nacional because we were very tired from having woken up at 4am and also we would be starting our tour the next day. We had thought we would have another opportunity to go to the jazz club, but as I will explain later, we ended up at another hotel and so didn’t get the chance! Sunday morning we met with the tour group at about 9am. We were 15 people plus the guide. The whole group was Canadian, except for one young couple who were from Australia. It was a nice sized group, and everyone on the tour was really friendly. Our tour guide had a degree in translation, so his English was very good. 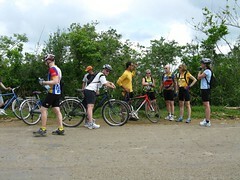 He has been guiding cycle tours for GAP for several years and was very knowledgeable. He told us a lot about the political, social and economic situation in Cuba. He seems to have given us a pretty balanced view of Cuban history, but there was certainly a bias, but that is understandable. We all learn about history in our own social context. Cuba has been governed by Fidel Castro since 1959, and now by his brother Raul (next year the country will celebrate 50 years since the revolution). They were the leaders of the revolution against Batista, who was a rather brutal dictator backed by the US. The country is basically a socialist state. Almost everything is nationalized, all salaries are paid by the government and health care and education are free. People are paid very little, and their pay depends on their job, experience, etc. There is also a large black market in Cuba. The country is a dual-currency state. There are Cuban pesos, and convertible pesos. People are paid in Cuban pesos, but much of what they need is available only in convertible pesos, which basically exacerbates the black market. Most Cubans have found other ways to augment their salary and make ends meet, but they won’t talk to you about how they do it. Our first day started on the bus. Although we were on a cycling tour, it was also combined with some time on the bus. 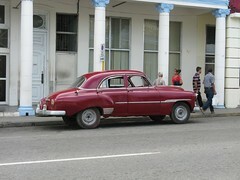 Our first stop was at a small town typical of Cuba, where we were able to walk around and take some photos. We arrived at our ‘camp ground’ in time for a late lunch of pork/chicken rice and beans. Although Cubans call the type of place we stayed at a camp ground, it was far from it. There was a pool, poolside bar, and cabins each having 2-4 rooms with hot water and A/C. It was pretty nice and in a lovely quiet and hilly setting near Pinar del Rio. In the afternoon, we tried out the bikes. I had brought my seat, in hopes of saving my behind, but the post was too big for the bikes they were providing us with! So it stayed in my suitcase for the rest of the trip and I was stuck with a different seat than the one I was used to. The bikes were pretty good – a German hybrid that was heavier than lead, but had 24 gears which was really helpful when climbing long and steep hills. 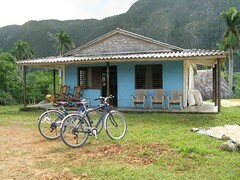 We rode for 5-10km to test out the bikes, then back to the hotel for a Cuban beer followed by dinner (of pork/chicken rice and beans, or fish!). On Monday, we started on the bus until we were fairly far out of town. 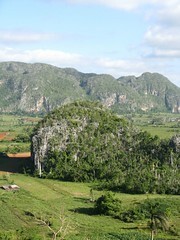 We stopped at a lookout for a view of the pincushion hills (mogotes) of Viñales that were surrounding us. They are limestone formations, which are really neat to see! Apparently they are one of two such sets in the world, the other being in Vietnam and covered by water. After that we got on the bikes and started on our ride to the beach! We rode for the morning, stopping fairly often so that the guide could tell us where to go. We were keeping up with the fast group without any problems. There were basically two groups of cyclist on the tour – one that does cycling tours all over the place, and another who don’t do much biking at all. Dave and I fit in somewhere in the middle. We were usually pulling up the rear of the fast group. The countryside was beautiful, although hilly (no one warned us about that!). The roads we biked on most of the trip didn’t have a lot of traffic, which was really nice. Eventually we made it to Cayo Jutias, after I asked for directions from a man walking down the road and also talked our way through the first guard post on the way to the quay. Speaking Spanish has its advantages when the guide is back with the slow group! At the beach, which was a beautiful long white sandy beach without many people (and the sun was shining and lovely), we had a picnic lunch and spent a few hours relaxing. Lunch was bread, guava paste, some sort of vegetable spread, cold chicken dogs, and sardines. I guess its tough to buy in bulk in Cuba, and this was all there was available! But it did make a change from chicken, rice and beans. After the beach, it was back on the bus to go to the hotel. We were supposed to stay at one hotel near Vinales, but when we got there our guide told us to wait while he checked on the reservation. Apparently he knew what was up, because he came back and we crossed town to go to a different hotel. I guess it’s easy to change hotels when they are all run by the government. The hotel we ended up at was quite nice. Our room was really big, with a little patio overlooking the pool. Dinner was a buffet and afterwards we watched a show of typical Afro-Cuban dancing and singing, which curiously involved a man sticking fire down his pants. 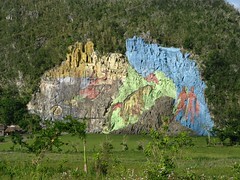 Tuesday morning we started off by visiting a mural painted a limestone hillside years and years ago, which has one of two meanings. Either it is the story of the revolution, or the story of evolution. It is a large colourful mural which starts with insects, moves through dinosaurs and ends with man. From there we went to Che Guevara’s cave. Early after the revolution, the cave was being turned into a tourist attraction when Che saw it and decided it would be a good spot to live and train before he went to Bolivia. So he lived there with some guards, and the cave was surrounded by hundreds of troops. He had a bedroom, kitchen and communications room. The tour guide there was an ex-history professor, who didn’t have much confidence in his English. By the end of the tour, I was translating for him into English! We saw a lot of damage from the hurricanes that have passed through Cuba in this area – a lot of trees were down, and roofs blown off. After visiting the caves, we got on the bikes and rode through the countryside. The paved roads were bumpier than the gravel roads, and I was really missing my front shocks! We had lunch at a family farm. The family has tour groups stop in and see their home, and provided us with lunch made from typical Cuban food. The house had the prerequisite rocking chairs out front, the prerequisite dogs, oxen and horses and a lovely latrine that was so clean! I was impressed. Lunch was pork (surprised? ), rice, beans, yucca, and a typical soup. It was quite good! We all gave them a little something for lunch and headed back to the ‘campground’ where we stayed earlier in the week, where we had another dinner that was beginning to look familiar. After dinner, we hung out with some of the other tour members for a while by the pool. Wednesday morning we visited a cigar factory in Pinar del Rio. We had a tour of the factory, where we saw workers (mostly women) rolling cigars, selecting the best leaves for the wrapping, the quality control process, and then how they are boxed. It was pretty interesting! All the cigar factories are government-owned, and make all brands/types of cigars. The brands and types depend on the leaves themselves. After the cigar factory, we cycled to San Diego de los Baños, where there are some hot springs and there used to be a spa of some sort, but which has been closed for several years. Our cycling took us up several long and steep hills. Dave’s biked broke on him halfway up one of the hills – his back axle dropped out and as a result the brakes jammed. So he was stuck basically dragging his bike up the rest of the hill. At the top of the hill, with the proper tools, it was fixed in a jiffy. We were also cycling through a hot part of the day. We stopped for lunch in a town square – left over chicken dogs and sardines! We arrived in San Diego de los Banos mid-afternoon, and were welcomed to the hotel with a rum and coke by the pool. Unfortunately, that is about where the good parts of this particular hotel ended. The place was full of mould. I am not sure whether it was the result of the recent hurricanes or the fact that Cuba is really really humid to begin with, but it was pretty bad. So we decided to spend as little time as possible in the room. We went for a long walk through the town and saw some kids playing baseball in a diamond on the edge of town. Baseball is very popular in Cuba, even more popular that futbol. We had dinner at the hotel, another buffet which was decent, and then went down to the poolside for some live Cuban music which was lots of fun! Pretty funny to see a whole bunch of German and Canadian tourists listening to Cuban music…all sitting still. The musicians got us up to do a bit of dancing though. Thursday was our last day of cycling. Throughout the tour we averaged about 50 km a day on the days we were biking. On the last day we were told we had 3 hours to bike, and then the bus would start picking us up so that we could get to Las Terrazas in time for lunch. Or, if we made it to a town called Candelaria, to stop there. Dave and I started out after breakfast and basically cycled alone for the next 3 hours. It was a nice ride. Not much traffic, no killer hills, although the headwind did pick up near the end of the trip. At one point we went through a downpour, but it was so hot so we didn’t mind getting soaked. We also passed a goose farm (who knew such a thing existed?!). We made it to Candelaria and waited with the rest of the faster group for the bus to come pick us up and then we headed to Las Terrazas. Las Terrazas is a UNESCO biosphere reserve. It is a self-sustaining community, where we ate a delicious lunch (of pork, rice and beans! ), then went to a river and small waterfall where a few people went for a swim while the rest of us relaxed for a while. From there we went to Soroa, where we were supposed to stay for the night. We got there late afternoon, and unfortunately there was a problem with the booking. In this case, it wasn’t as easy to switch hotels, because I’m not sure there was another one that was big enough to take the group there. Apparently there were two groups booked at the hotel (of which we were one), but another group without the right papers got there first and were given rooms. Long story short, they couldn’t exactly kick them out, so since we were supposed to go to Havana the next morning anyway, we got back on the bus (several hours later) to head back to Havana that night. Our guide managed to get the tour company to upgrade us to another hotel, which was way nicer than the original Havana hotel, so that was good! Once in Havana, we went out for a nice dinner with the group. Since we were already in Havana, we started the day a bit later than usual. We were picked up at about 10am, and we headed on a tour of the city. We drove through Vedado, past the US Interest Office (where they broadcast scrolling written messages about the benefits of democracy from the windows, so Castro built a monument full of flags right beside so that the public can’t really see the messages), along the Malecon, past the old forts that once guarded the city, and into old Havana. We had a some lunch and stopped at La Floridita, where Hemingway used to go for a daquiri or two. In old Havana, we walked through the four main plazas. 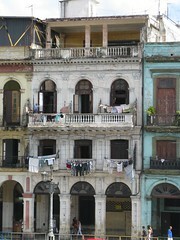 Much of old Havana has or is being rehabilitated thanks to UNESCO. It really is beautiful. We learned a lot about the history of the city. We also visited the Havana Club rum museum, where we had a tour of the distillery process and an incredible model of how rum used to be processed from the sugar cane fields to the distillery, with a working train. It was incredible. There was also a tasting at the end. After the walking tour, we wandered through an artisan market, where people were selling souvenirs and artwork. That night, we had our last group dinner and said our goodbyes to everyone. It was this night that I had expected to be able to go to the jazz club, but because of the location of our new hotel, we weren’t able to. Submitted by Darwin (not verified) on Sat, 2009-05-16 01:12. Submitted by Meg on Thu, 2008-12-04 21:09. 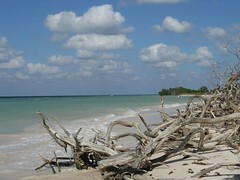 The resort will be the subject of Cuba Part 2 :) But it was great! We enjoyed it. In a nutshell - it was nice, our room was good with a nice view, the food was good and so was the beach! Submitted by Bonnie (not verified) on Thu, 2008-12-04 08:40. Ahhh!! Sounds like a great trip!! I hope you and Dave had a great time. You never said...how was the Sandal's resort?